All the flavors of Banana Cream Pie come together in this simple to make poke cake! 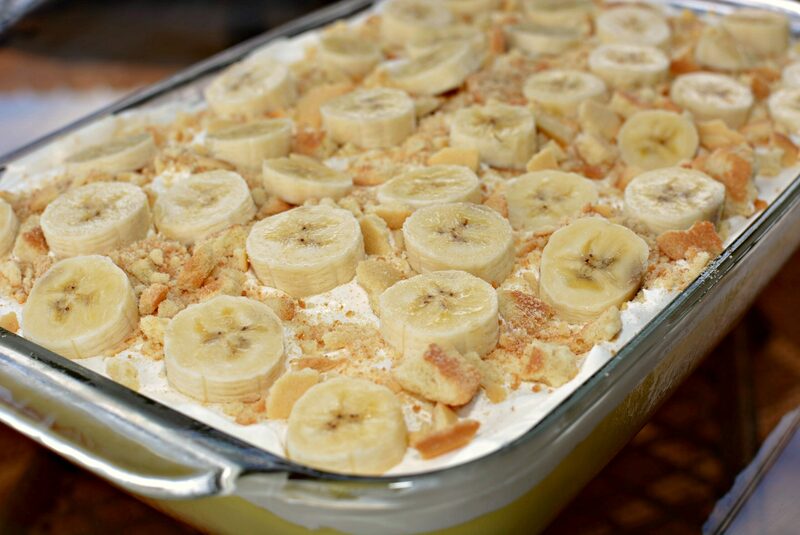 Perfect for potlucks and gatherings, this is the perfect dessert for any occasion! A few weeks ago, I had my family over for Easter. We did things potluck style and my mom brought her tasty strawberry pretzel salad and hash brown potato bake. My brother and sister in law brought amazing veggies (I’ll need to steal those recipes from her soon, haha), and my hubby and I were in charge of smoking a pork loin. Since you can’t NOT have dessert on Easter (that’s a rule, right?!? 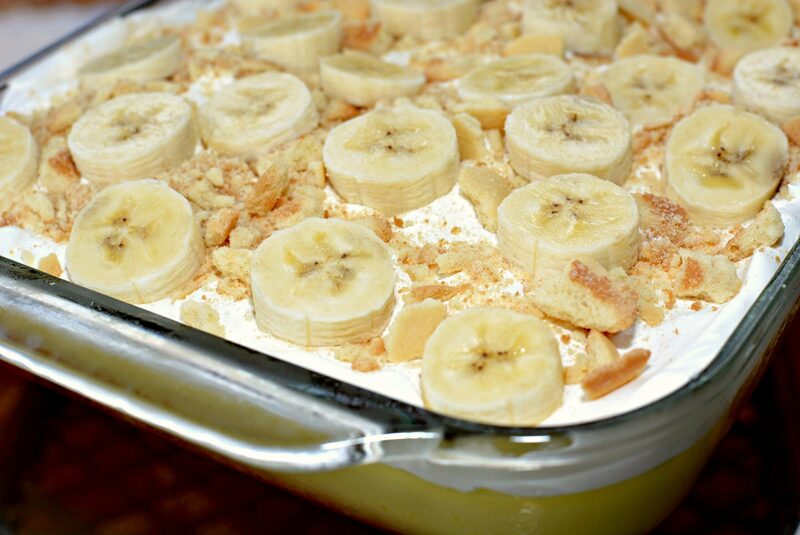 ), I decided to make this Banana Pudding Poke Cake as a refreshing sweet treat to enjoy! 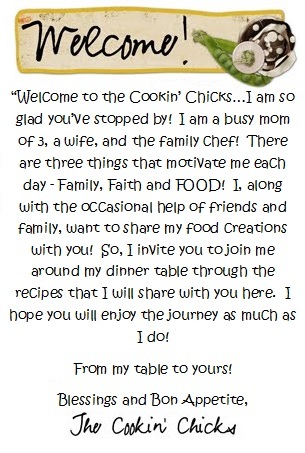 Not only was it incredibly simple to prepare, everyone loved it, especially the kids! 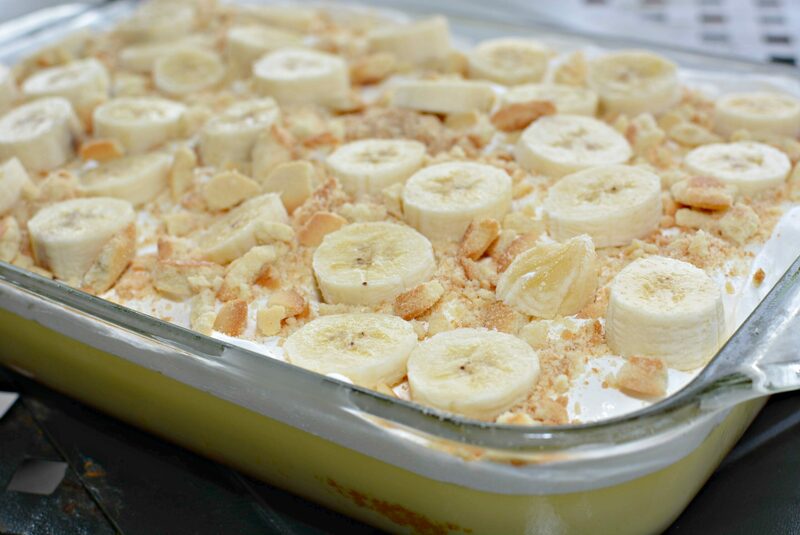 Using a boxed cake mix, this shortcut version was moist, full of tasty banana pudding, Vanilla wafers, cool whip, and of course, banana slices. What more could you ask for, right?!?! This is just the cake to make if going to a picnic, potluck, party, or gathering as it feeds tons of people! This may just be my new go to dessert as we head into the warmer summer weather! 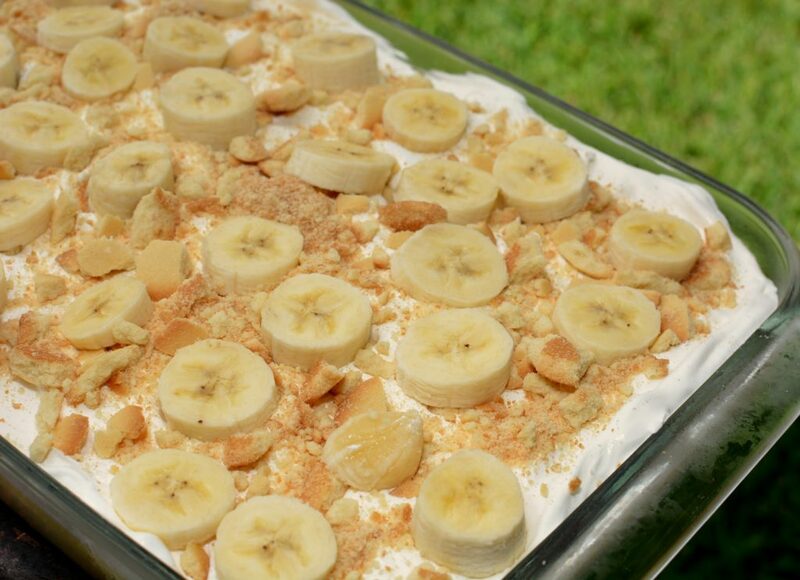 All the flavors of Banana Cream Pie come together in this poke cake! Prepare cake in a 9x13 pan according to directions on the box. Once baked, allow to cool for about 5-10 minutes. Using the back of a spoon, poke several holes into the top of the cake. Prepare pudding by combining the pudding mix and milk together in a bowl with a whisk until no lumps are present. Evenly pour pudding mixture on top of cake filling each of the holes. Place pan into refrigerator for at least 2 hours, or until set. Spread whipped topping evenly on top, followed by the crush wafers. Finish the cake by placing the banana slices on top as desired. Serve and enjoy! 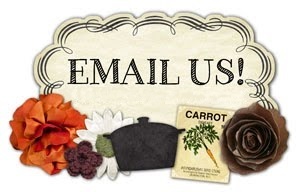 Be sure to refrigerate any leftovers! This is wonderful! 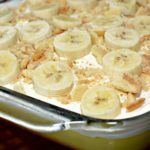 The banana pudding is key … I only made one change.. instead of whipped topping like cool whip I made my own from heavy cream it’s less sweet and I liked that .. otherwise I made this as written and loved it! Yea!! So glad you enjoyed it! Great idea on making your own cream!! Does the banana get dark if made the day before? I have made it up to one day prior and it stayed great. You can always add the banana to the top prior to serving though! Do u let it cool completely before adding the pudding to the top? Nope, you only need to wait about 5-10 minutes before adding the pudding!